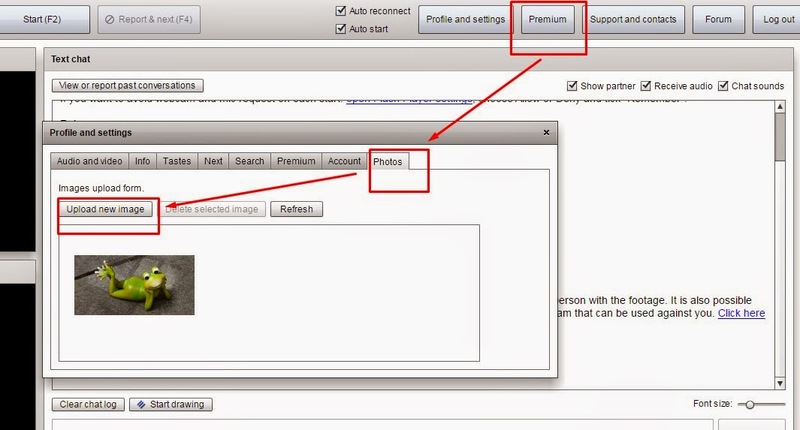 How To Add Profile Pictures On Chatroulette? How to upload a photo to Chatroulette profile, adding photos to Chatroulette profile, how to add photos on Chatroulette, Chatroulette upload profile pictures, adding profile pictures on Chatroulette and more is given in this article. Chatroulette is a well-known and visited thousands of the people at the second. You may chat here with people on webcam or chat without webcam. You may choose that with Flash Player settings and "Deny" the webcam to work. So you'll chat people without webcams too. You may see someone on webcam with their profile pictures, if you chat with text chat here and without webcam, it's possible that you'll she people with their pictures on Chatroulette. Even if they use webcam, you may see their photos too. Click to "Upload new image"
That's easy to do. When you start random chat on Chatroulette, people'll see your pictures. So you won't need to open webcam at first and it'll tell you and show people how a person you are. That's a better way than opening webcam may be. You may show your picture and chat with girls/boys with this method. You'll need more tips of course to find more girls on Chatroulette, lok at Chatrooulete Tips page fore more.